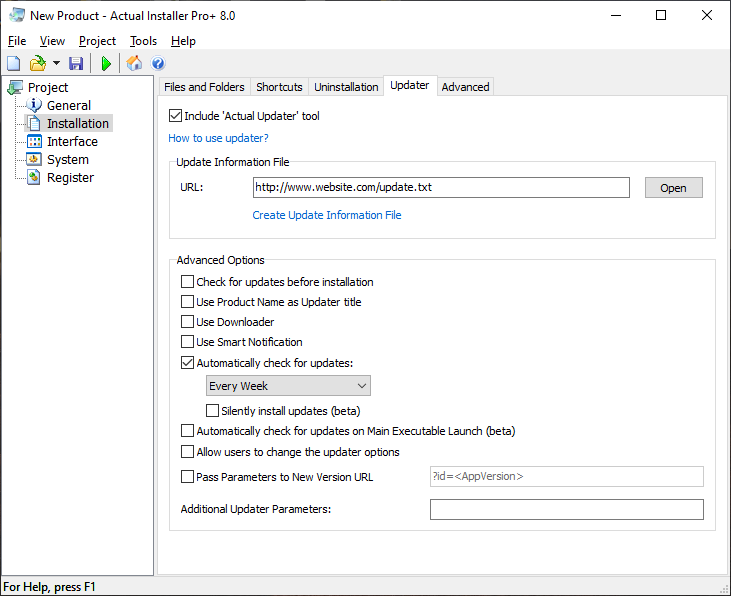 Actual Updater can be integrated in any Windows software no matter what installer you use for the distribution. But you can simplify the whole process of the program distribution if you use our installation system, Actual Installer, as it has the built-in update feature. Just select the option "Include Actual Updater tool" and specify the URL for the Update Information File. You don't have to create the "Updater.ini" file as the setup program uses for the update purpose the file "Uninstall.ini", which is created during installation. Just make sure that the option "Include Uninstaller" is selected on the page "Installation \ Uninstallation". And you don't have to copy the file "Updater.exe" into your app's main folder as it will be automatically installed with your program during installation.